It's year 2009, I was at a car sales expo or show or whatever you call it, where they line the cars up on a grassy field, stick a price tag on the front windshield and invite the public to come take a look. Saw a UG GTI 09' and thought this might be a nice car to have. 2 months later it was still at the dealership's lot when all the Mk6s started arriving, test drove them both. Bought the Mk5. This is what it looked like when I brought it back to my home in Slovenia (I was living in the US at the time when I bought it). Completely stock I drove it like that for a while, a long while I might add. Year 2012, something bit me and made me itch a little bit at first. We've all been there, standing there looking at your car, with an itch in the back of your head and what ifs roaming wild. The mod bug as we all call it had done it's damage. Started with the little stuff and said no way I'd do anything bigger to my car. I was so wrong. 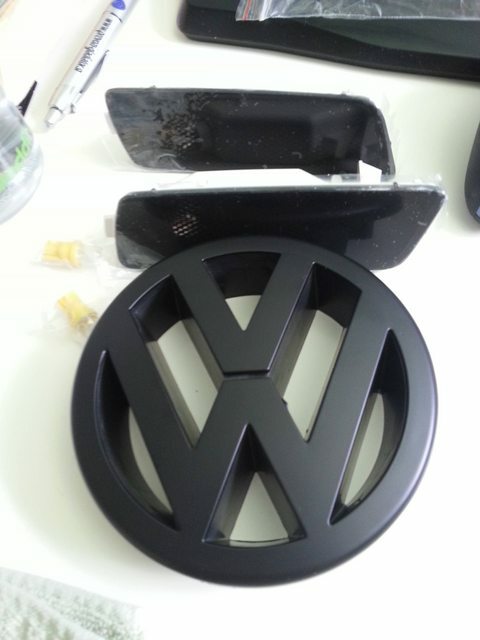 Well, didn't like the orange sidemarkers (Europe doesn't have these, only US), so I got some black ones and also a black front VW emblem. Also got an Injen filter on a stick, since I was doing something. Why not? Also at the same time went Stage 1 (revo). Now I thought my car was pretty banging at this point, but it didn't sound like it. So, I ordered a full Milltek TBE with the R32-style catback. Last edited by JanK; 03-28-2014 at 09:14 PM. Called up my tuning shop (69performance, not even kidding) told em what I wanted, ordered the parts. Told me to send em my gas tank cap for color matching, so I did. Drove like that for a while, quite the spectacle to everyone. While waiting for the R32 bumper and TBE, I got bored so I went on eBay to check out some of the LED interior lights (parking light and license plate ones too) and I bought some CAN BUS ones, to dismiss any fears of a bulb out error. Looked pretty good in the end. The interior was now bright as hell. Last edited by JanK; 03-20-2014 at 11:54 AM. The TBE and bumper arrived a week later and we went to work. We started when it was still light outside and I think we ended working till 3 or 2 in the morning. When we were done we were pretty exhausted (no pun intented) and went for a test drive, then went home to crash. We woke up to something nice. Last edited by JanK; 03-20-2014 at 02:06 PM. Ran into some money, spent it big time. Last edited by JanK; 03-21-2014 at 08:12 AM. I thought since I would like to see the new power resulting from higher boost, I'd need a way to physically check it, so I bought a Newsouth Performance boost gauge. Last edited by JanK; 03-21-2014 at 08:18 AM. Right now I've bought a new catch can from 034motorsport and an AWE tuning CCB intake that I'm planning on installing in a few days. Also the USP motorsport automatic light sensor to work with the auto chrome headlight switch I bought, but the sensor still needs to arrive. The reason I'm changing intakes is some parts aesthetics, some parts fuel trim issues. I've had this Injen intake for about a year now and have gotten during that time only 4 CEL lights due to fuel trim being too lean. We'll see how the AWE tuning's intake fares. The reason why I'm switching catch cans is due to the capacity of the can itself. Forge's is quite small compared to the 034 motorsports one I just got and it's quite a higher tier of quality, to which I'm pleased. Plus it's got an oil return line for the can which I'm debating using, but haven't finalized my decision yet. Car looks like it will be fun to drive. Any weight reduction planned? Who's the girl in your avatar? Yeah, it's quite an interesting thing having an LSD, throttling in corners is much more predictable and wheelspin isn't one sided anymore. Maybe in the future, but since this is my daily, I want to keep it as usable as possible. When I get a second car for a daily, I'm willing to go berserk on this one. The girl is Arabella Drummond. Why? So he too can drive like a toolbag? This was fun and hard work. It also made me realize that it's all bare metal under the plastic facade. Truly eye opening. Bought some R8 coilpacks, which I've put in the past week after one of my cylinders completely stopped working. Running on 3 cylinders wasn't fun.. Put in an RCD-510, which greatly cleaned up the center console, that premium 7 radio was behind it's time.. Installed DoubleApex's USB charger, which is probably the most practical mod, I've ever done. Love the company and the way they present their product through packaging. Hope to see more from them. Last edited by JanK; 03-22-2014 at 01:10 PM. Great build man. Really wish I had more pics of parts like you do. Jelly of the lsd not to mention the k04 and all the other go fast bits I don't have. On a side note. What is it you did with you gas cap? I'm confused a little on that one. I think he sent it off when the rear end was ordered so it could be colour matched properly. This build and yours Elliott are my two favourite "builds" going! Keep up the awesome work! Thanks man, I love your build too! Love the way DoubleApex package their products. Always a joy opening them. These are direct replacement ones, not just some paddles you stick with double sided tape. Installing these as soon as I can. Those look great. I have the stick on ones and to be perfectly honest they've been awesom, and for only 15 bucks. But these are amazing! Last night I decided I needed to put the DSG paddles on, so I drove to my friend's house 2 clicks away from mine and came bearing gifts of friendship (beer) so I didn't have to do it alone. First up, reading the instructions carefully before you throw them out your window, because we all know you know what you're doing. Disconnected the battery and looked at the fuse box, to pull out the third one for the airbag. Setting up our makeshift mirror and light. The instructions mentioned something about a 2min break, for any residual electricity to dissipate. So we took this time to discard them for our beer and took a 5min break. The beer is called Bevog btw and is locally brewed 45min from my location in Austria.. by a Slovenian. This was less than comfortable to do, but with liquid courage in our asses it was fine. After we got the paddles out, we needed to switch the stock outer paddle with the DoubleApex one, this was a bit tough on the fingers. Both sides complete, with airbag back clipped into the steering wheel. Looks quite good and feels even better.